From the Ozarks to the Delta, you’ll find floatable rivers, creeks and water trails that afford beautiful scenery, a glimpse at native wildlife and unplugged family bonding time. Here are six great floats for families, plus tips for safety and preparation. From the Ozarks to the Delta, you’ll find floatable rivers, creeks and water trails that afford beautiful scenery, a glimpse at native wildlife and unplugged family bonding time. In fact, according to the Arkansas Game & Fish Commission, the state boasts more than 600,000 acres of lakes and more than 90,000 miles of rivers, streams and creeks. Families who want to dip their toes in the water should start out with a crucial step: research. The most important part of floating is preparation, and you should consider where you are going to put your boat in and where you’ll take it out. You also need to consider the water level, recent rainfall, and the amount of time you’re going to be on the water—which will affect how much drinking water, sunscreen and food you'll need. Many major floating rivers have outfitter services, which take a lot of the work out of preparing for a float with families. The outfitters will rent boats, lifejackets, paddles and other equipment to visitors. The companies will also run shuttles that take you directly to easy entry points and will pick you up at the end of your float. However, families should always discuss paddling safety and what to do in case of emergencies (see safety tips below). Doss also recommends attending a workshop or class before embarking on a float trip: “A little bit of instruction goes a long way in keeping people safe,” she says. The Arkansas Canoe Club offers paddling schools twice a year, and will also host clinics for groups. A great choice for first-time paddlers, this slow-moving stream is dotted with picturesque Cypress Trees and leads all the way down to the popular Two Rivers Bridge. Plus, families can take guided canoeing or kayaking tours led by a Pinnacle Mountain park interpreter. For info on upcoming floats, visit ArkansasStateParks.com/PinnacleMountain. One of the most popular floating rivers in the state, the lower part of the Buffalo is easy-going and usually has water year-round. And since it's a "wild river," you'll be surrounded by trees and nature your entire route—don't forget your binoculars to spy on birds and wildlife. Multiple outfitters offer a variety of tours and rental services. Find more info at NPS.gov/Buff. Near the Missouri border and fed by the Mammoth Spring, the Spring River flows year-round with crystal clear 58-degree water. Steer clear of the party crowds on the weekend and try a week-day float for a calmer, more family-friendly experience. Find more info and a guide to the many outfitters at Arkansas.com. Popular as a floating river for families and frequent paddlers alike, and the Caddo runs 40 miles from the Ouachita Mountains all the way to DeGray Lake. 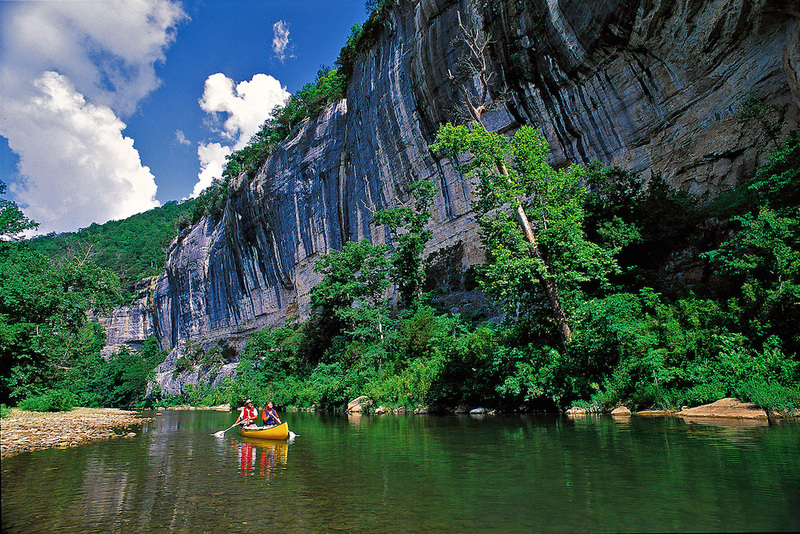 Beginners enjoy the six-mile float from Caddo Gap to Glenwood, which includes a few small rapids. Or, for a slower float, hop in the canoe at Glenwood and ride to Amity. Several outfitters provide rental and shuttle services. For more info, visit Arkansas.com. Running right through Benton, this is a close-to-home option for families in central Arkansas. The serene river runs through forests, fields and farmlands and is a great spot for fishing, swimming and scoping out wildlife. Saline River Canoe offers a short and sweet 4-mile float from Peeler Bend to Lyle Park. For more info, visit SalineRiverCanoe.com. Adventurous families seek out the Ouachita. In fact, you don't even need a canoe or kayak to float from Remmel Dam at Lake Catherine to the whitewater park in Rockport near Malvern—many hop right in with pool rings and rafts for the gentle float. Plus, scheduled releases from Remmel Dam usually keep the water levels high enough to float even in the drier summer months. For more info, visit Arkansas.com, or find out about tube rentals and shuttle services at OrbiRentals.com. Visit ArkansasCanoeClub.com or AGFC.com for information about paddling and water trails. Canoeing, kayaking and rafting are fun summertime activities, but can be dangerous if you act recklessly or fail to take proper precautions. • Wear lifejackets. Children 12 and under must wear a life jacket that is securely fastened while on board any vessel. • Bring along snacks and plenty of water. • Wear sunscreen, a hat and protective footgear. • Pack a first aid kit in case of scrapes, bumps or bruises, and bring along insect repellent. • Know your physical limitations and the limitations of your children, and don’t go on a long trip for your first float. • Check weather forecasts, and call an outfitter ahead of time to confirm that the river is currently safe for paddling. • If you go over in a current, keep floating until you can get out where it’s safe. Swim away from the boat, so that it doesn’t wash down on top of you. • Also, if you fall out of the boat in a rapid, do not try to stand up. Your foot can get stuck on the bottom of the river and the pressure of the current could pin you down. For more tips on paddling safety as well as laws for Arkansas Waterways, visit Arkansas Game & Fish Commission at AGFC.com.